looks at the number one goal for the world: eradicating what is called ‘extreme or absolute poverty’ – the condition of around a billion people, currently measured as living on less than $1.25 a day - for the first time in human history. Rosling will once again use holographic-style projection technology to wield his iconic bubble graphs and income mountains to present an upbeat assessment of our ability to achieve that goal by 2030. Eye-opening, funny and data-packed performances make Rosling one of the world’s most sought-after and influential public speakers. 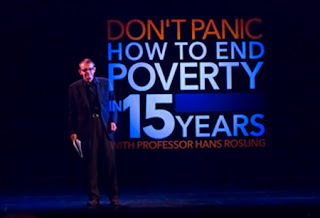 For Don’t Panic: How To End Poverty In 15 Years he innovatively brings to life the challenge of eradicating extreme poverty worldwide, interweaving dramatic statistics with powerful human stories from families in Malawi and Cambodia.